There is No Tsunami Warning, Advisory, Watch, or Threat in effect. It’s a big one and long been expected, a mag 6.8, downgraded to mag 6.5 has struck off the Californian coast this afternoon. 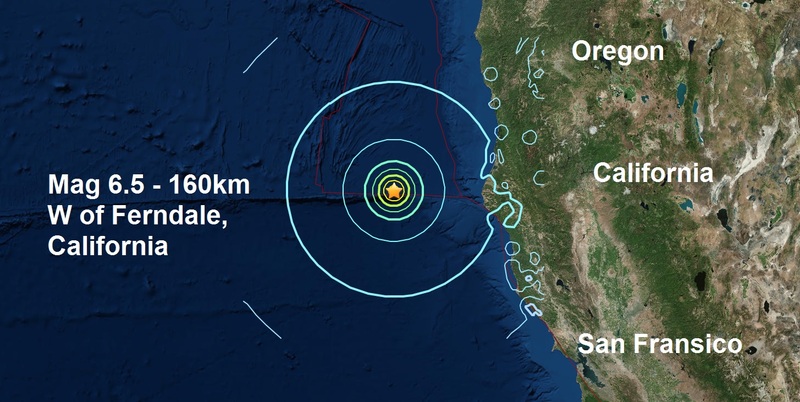 The quake occurred about 100 miles off the coast of Eureka around 6:50 a.m. There were no immediate reports of injuries or damage. The depth of the quake was about 6.2 miles, according to the U.S. Geological Survey, which issued no tsunami warnings in connection with the temblor. According to USGS mapping, the temblor, while strong, did not produce violent shaking on land.